Duri Cosmetics is getting us ready for Valentine's Day by serving up some up yummy pinks and reds in their 2011 Valentine Collection. The collection consists of 4 nail colors perfect for every woman. Whether you like a sultry look or a soft feminine look. This collection has something for all of us. Every Day Is Valentine is a fire-engine red. Hot Date is a flirty fushia. Cupid Rules--a bubblegum pink. It's a soft/sweet shade so if you like a girly polish this one is definitely for you. And Contessa--a shimmery Burgundy. It's a very pretty shade that will definitely dress up your manicure. I really liked them both however they weren't as pigmented as I would have liked, therefore I had to put on a few coats to get the desired look. Other than that I thought they were great looking shades that will be a nice add to my collection. *Products were provided for review. See disclaimer/disclosure for more info. 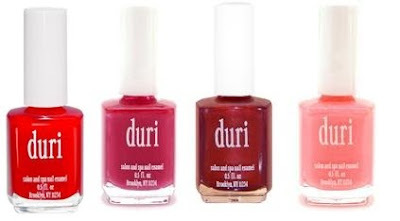 I've never heard of Duri, but I like the Contessa color! Are they only available online? These colors look gorgeous on you..I'm loving Contessa. It's a very pretty color!! What a great post love how the colors look on you.